McNaughton High School has hired more new teachers than the Estevan Comp and the Weyburn Comp this year. School is back in this week, starting Tuesday in the Southeast Cornerstone School Division and Wednesday in the Fort La Bosse School Division. 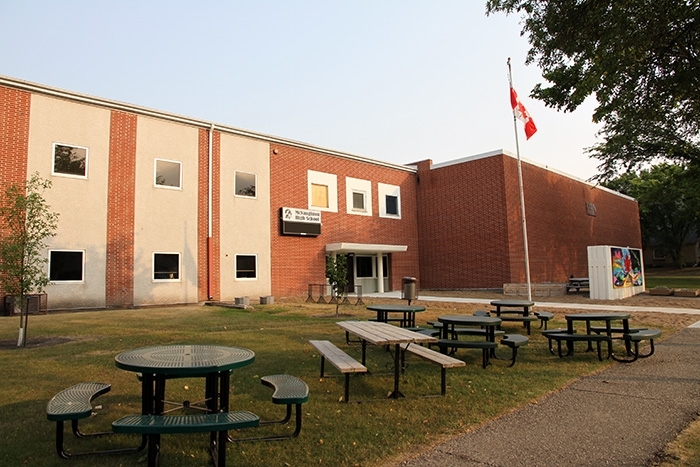 One school that will be seeing an increase in the number of students again this year is Moosomin’s McNaughton High School. The school has seen a continual increase over the last several years, and is projecting an increase of another 100 students over the next few years. “Kids are coming in and registering,” Principal Jeff St. Onge said Wednesday. “We had seven new kids on Monday, two on Tuesday, and three today. Each February, the Southeast Cornerstone School Division estimates enrollments for each school. St. Onge says the number of students is projected to continue increasing. “The year before last our projected enrollment was 288. Last year the projection was 314, and we actually had 330. This year it is 349 then in the next three years we are looking at 394, then 419, then 449.” Each year, McNaughton High School has had enrolments higher than those projected by the school division. Where are the additional students coming from? “Some of the difference is more coming from the elementary school than are graduating,” said St. Onge. “This year, for example, my graduating class is 41 and I have 60 kids coming over here from grade five so I’m up 19 right there, add seven from Wapella and I’m up by 25. All of a sudden your 330 is 345 and those are just the kids I know. The bubble is already there in MacLeod. I’m sending out smaller enrolments than are coming into the building right now. The story isn’t the same everywhere across Southeast Cornerstone. There are no big curriculum changes this fall, but St. Onge said more and more students are opting for individual programming. McNaughton High will welcome students back with a barbecue lunch on Friday.